Many of those still undecided how they will vote next month have an answer provided to them by their hearts but have yet to sway their heads on pragmatic concerns how life will turn out either way, based on credible figures. Prime among those concerns—especially for those over fifty—are pensions. 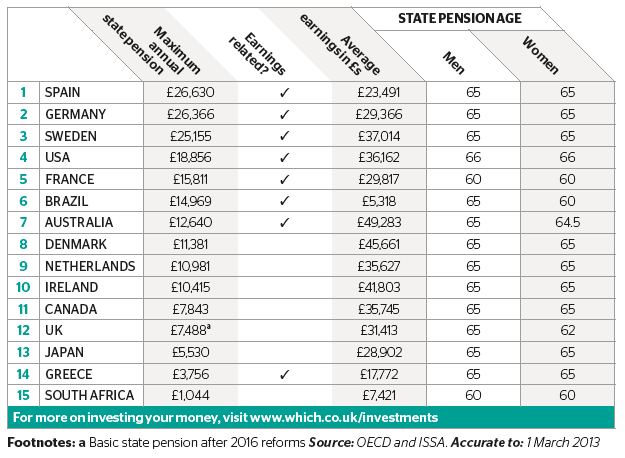 The UK does not have a particularly good record on providing pensions. Thatcher broke the link that raised state pensions with inflation then punted private pensions that were missold by the billion. This approach was continued under Blair and indeed worsened when Irn Broon raided private pensions and compounded during the 2008 fiscal crisis when many private pension pots lost half their value. This left UK taxpayers with a third-world-standard state pension of around £5,500 in 2013. Although this is to be raised to £7,500 by 2016, this is offset by a rise in pension age to 67. In contrast, Finland provides £14,100 per annum. Norway provides some 75% of average earnings from the state pension alone—around £10,650, with occupational pensions topping this up further. Even taking private pensions into account, UK lags in terms of share of GDP dedicated to pensions. All four Scandinavian countries, along with Germany, France and Italy exceed the OECD average of just under 10%; UK lags below 9%, behind even the USA. Will my state pension be as much as it is now? Yes, in fact it will be better. The Scottish Government have guaranteed a “triple lock” on state pensions after independence – something Westminster have only put in place until next year’s General Election. This triple lock means the state pension after a Yes vote will rise in line with prices and earnings, or by 2.5 per cent, whichever is highest. What about this new single tier pension being offered by Westminster? Will we get that after independence? Yes. The Scottish Government will pay a single tier pension of £160 a week from 2016 – that’s £1.10 a week higher than currently being promised by Westminster. But I am on Savings Credit, will I still get that? Yes, the Scottish Government will pay savings credit at £18 a week, benefiting 9000 low income pensioners. Westminster plans to abolish Savings Credit after April 2016. So voting No will hurt the poorest. Will the state pension age be the same? It could be lower. The UK government will raise it to 66 by 2020 and then move it to 67 later. The Scottish Government think that is unfair because Scots do not live as long, so would get less pension if we stay with Westminster. After independence, a Scottish Government will ask pensions experts to look at keeping the retirement age below 67. But how can an independent Scotland afford better pensions? Pensions are more affordable in Scotland because we pay more tax per head than in the rest of the UK. Expenditure on pensions and benefits known as “social protection” have been lower in Scotland in each of the past five years. For example, social protection in 2012/13 was 15.5 per cent of Scotland’s national wealth, compared to 16 per cent for UK. I have an occupational pension, what happens to that? Occupational and personal pension rights will stay the same after independence – you have accrued these benefits and are legally entitled to them. What happens to my NHS/civil service/council pension? The Scottish Government will meet all public sector pension obligations and all schemes will be fully protected. The Scottish Public Pensions Agency are already administering a lot of public sector pensions here and will take on new responsibilities after independence and that may create new jobs – a bonus. But isn’t it safer to stay as we are? A No vote will not mean things stay as they are. It means retiring at 67 – or even older, a loss of Savings Credit for the poorest pensioners and a smaller single-tier pension. Remember, the UK Government’s track record with pensions is poor. It’s a good argument to transfer responsibility for pensions to a parliament with a better track record of looking after them.